Der Artikel Diary Of A Lost Girl (1929) (Blu-ray & DVD) (UK-Import mit deutschen Untertiteln) wurde in den Warenkorb gelegt. Drama / Stummfilm, 113 Min. A masterwork of the German silent cinema whose reputation has only increased over time, Diary of a Lost Girl [Tagebuch einer Verlorenen] traces the journey of a young woman from the pit of despair to the moment of personal awakening. 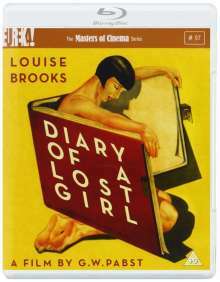 Directed with virtuoso flair by the great G. W. Pabst, Diary of a Lost Girl represents the final pairing of the filmmaker with screen icon Louise Brooks, mere months after their first collaboration in the now-legendary Pandora’s Box [Die Büchse der Pandora]. Brooks plays Thymian Henning, an unprepossessing young woman seduced by an unscrupulous and mercenary character employed at her father’s pharmacy (played with gusto by Fritz Rasp, the degenerate villain of such Fritz Lang classics as Metropolis, Spione, and Frau im Mond). After Thymian gives birth to his child and rejects her family’s expectations for marriage, the baby is stripped from her care, and Thymian enters a purgatorial reform school that seems less an institute of higher learning than a conduit for fulfilling the headmistress’s sadistic sexual fantasies. The Masters of Cinema Series is proud to present this glorious restoration of an iconic German film for the first time anywhere on Blu-ray.